Amelanchier alnifolia (Nutt.) Nutt. ex M. Roem. Shrub or rarely a small tree, 1-6 (10) m tall; stems slender, smooth; twigs smooth, reddish-brown; bark greyish to red-brown; sometimes spreading by rhizomes or stolons and forming dense colonies. Alternate, deciduous, oval to oblong-elliptic or nearly round, saw-toothed mostly on top half but sometimes nearly entire, broadly rounded to somewhat squared-off at the tip, smooth to variously hairy at least below; blades 2-5 cm long, stalks 0.5-2 cm long. Inflorescences short, drooping to erect, leafy or bracted, terminal racemes at the ends of branches; flowers 3 to 20, on slender ascending stalks; corollas white, the petals 5, linear to lanceolate, 6-25 mm long; calyces 5-lobed, the lobes lance-triangular, 1-5 mm long, the hypanthium 1-2 mm long; ovaries inferior, smooth or hairy on top; stamens about 20. Berry-like pomes (like miniature apples), crowned with the persistent calyx, globe- to egg-shaped, 5-14 mm long, dull red initially, becoming purple to nearly black, with a white bloom. 1. Petals less than 12 mm long; tops of ovaries strongly hairy. 2. Flowers generally with 4 styles; leaves entire or with a few tiny teeth near tips................. var. humptulipensis (G.N. Jones) C.L. Hitchc. 1. Petals over 12 mm long; tops of ovaries hairy or smooth. 3. Petals generally less than 16 mm long and 4 mm wide; calyx lobes averaging less than 3 mm long; top of ovary woolly....................var. semiintegrifolia (Hook.) C.L. Hitchc. 3. 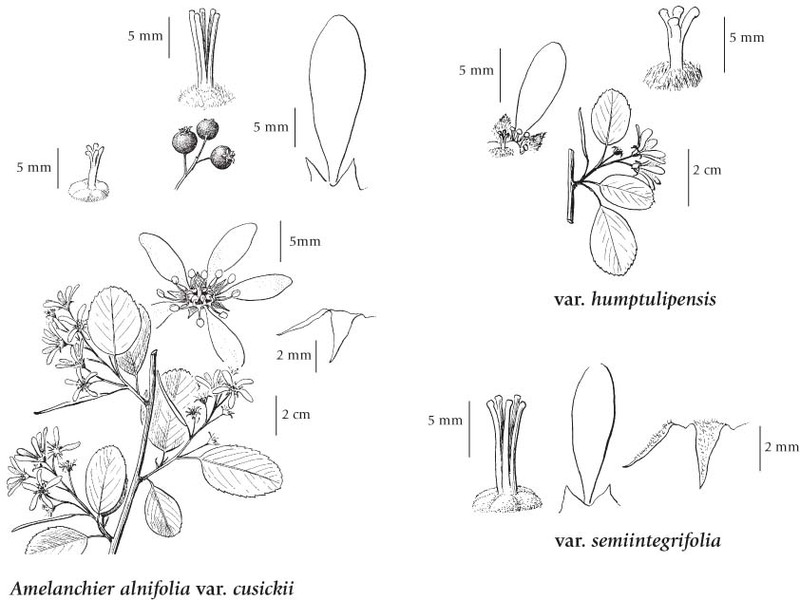 Petals generally greater than 16 mm long and up to 8.5 mm wide; calyx lobes averaging more than 3 mm long; top of ovary smooth to moderately hairy...................... var. cusickii (Fern.) C.L. Hitchc. Dry to mesic, open rocky slopes, bluffs, gullies, thickets, forest margins and open forests in the lowland to subalpine zones; common throughout BC, especially in C and S BC, east of the Coast-Cascade Mountains; N to AK, E to AB and S to CA, NE, ND, CO and AZ. 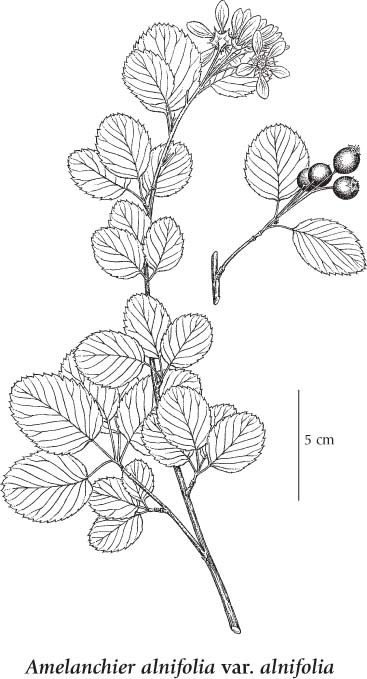 A shade-tolerant to shade-intolerant, submontane to montane, North American deciduous shrub distributed equally in the Pacific, Cordilleran, and Central regions. Occurs on moderately dry to fresh, nitrogen-medium soils within boreal, cool temperate, cool semiarid, and cool mesothermal climates. Its occurrence increases with increasing continentality, and decreases with increasing precipitation and elevation. Common to scattered in clearings and open-canopy Douglas-fir and lodgepole pine stands on water-shedding sites. Characteristic of young­seral forests on disturbed sites. Amelanchier alnifolia var. pumila (Torr. & A. Gray) C.K. Schneid.